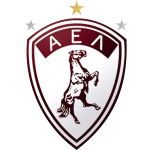 The club of Aleksandar Gojkovic, Larissa, presently holds tenth position in Super League (Greece) and second position in group Gr. 8 of Greece Cup (Greece). Measuring 183cm, Larissa's average player height matches the one of Aleksandar Gojkovic. He was used in 18 of the matches in the present term. He prefers to play with his left foot, as do 46% of his teammates. Born on August 10, 1986, Aleksandar Gojkovic's age of 32 exceeds his team's mean. Serbian defender Aleksandar Gojkovic, who is currently under contract to Larissa in Greece, joined the club January 21, 2018. Weighing 165.35lb, he measures 2lb less than the average player on Larissa. After an overall look at his career, we can see that he was substituted in twice but never out. In the active season, he was taken out more often just like in the previous one. Just five days ago Aleksandar Gojkovic played his latest match. In his footballer career, a total of 20 cards were ascribed to Aleksandar Gojkovic. While thus obtaining an average of 2.22 cards per term, he has not even gotten any yet, for now. He plays with the jersey number 39. His shortest spell with a club was eleven months in FK Borac Cacak (Serbia). The longest period that Aleksandar Gojkovic stayed in a team was three years and a day in FK Sloboda Uzice (Serbia) Superliga 17/18 (Serbia) has been his best season so far since he scored his personal highest amount of goals. On the other hand, his worst season was Superliga 16/17 due to him receiving most yellow and red cards of his career. Apart from Aleksandar Gojkovic, Slavko Bralic, Stefan Zivkovic, Vangelis Moras, Nikos Karanikas, Theodoros Tripotseris, Manolis Bertos, Christos Gromitsaris and Nikola Zizic are also defenders of Larissa. Before joining Larissa, he was engaged in the squads of FK Radnik Surdulica, FK Borac Cacak, FK Sloga Kraljevo and FK Sloboda Uzice. His squad concluded in a tie in 50% (40% home) in Super League and won 67% (100% home) in Greece Cup. The highest win streak of the last 5 matches happened in Super League with a count of 2. In the recent term, Aleksandar Gojkovic managed to find the net just not once and provided not once assists He scored an average of 0 goals and provided 0 assists per game so far, marking a slightly impaired performance when compared to last season, when he had 0.1 strikes and 0 assists per match.